Sprinkle salt and pepper on the pork shoulder then place in crock pot. In a medium pot over medium heat, melt the butter. Add the garlic, shallots, and jalapeno and sauté until soft (about 3 minutes). Stir in ketchup, vinegar, maple syrup, brown sugar, Worcestershire sauce, and liquid smoke. Simmer for 3 minutes, until the sugar has dissolved. Stir in the beer, and then pour the entire mixture over the pork shoulder in the crockpot. Turn on high and cook for 6.5 hours, or until the meat is falling off the bone. Place the cabbage, carrot, and jicama in a large bowl. In a small bowl, stir walnut oil, apple cider vinegar, salt, lime juice, and sour cream. Pour the walnut oil mixture over the vegetables and toss to coat. Refrigerate until serving time. To assemble, cut King's Hawaiian sweet rolls in half, and stack with pulled pork, hot sauce, and jicama slaw. I love the look and the sound of these sliders! I have never bought jicama but going to now, since this coleslaw recipe sounds delicious, crunchy and so healthy! I LOVE sliders! They are too cute! Yum...I think I know what I want for dinner tonight! I ADORE jicama. And I cannot even imagine the yumminess that is included in this slides. I adore jicama too! It's tough to get in Canada for some reason. It's rare to see it in stores. So, when i was in Mexico a few weeks back, I overdosed on jicama! *hehe* None of my travel mates had ever heard of jicama! My grandpa used to grow it in his garden and we'd eat it all summer. So tasty! I love the sound of the coleslaw! Yes I will say that a dentist's chair does make you day dream and I am glad it got you inspired to get out that crock pot. I would not do without it! I do have a weakness for pulled pork and have used it in several different cuisines. However the sliders you prepared here with the Jicama are something I do want to try. Your description is making me hungry. Of course your pictures had an influence too. Great post! this really sounds delish- especially the jicama slaw with walnut oil-terrific! Love the sliders. I've never cooked with jicama before but it looks great in that slaw. I really need to try Jicama! Your sliders look so yummy. I think the dentist would want a few! I know I do! Never had jicama either - I have to fix that now. This is a very interesting recipe...I have never tried cooking meat with beer. Its sounding so delicious and flavourful. Bookmarking this recipe for trying some day soon. Dear Jenn, I always watch the Food Network at the dentist! This is a delicious recipe. I do like jicama. It is almost like an apple, very delicious. I love the crunch of jicama... bet these were tasty! I love jicama ... I just found your site through another blog and subscribed to your feed. Can't wait to see what else you're making! I LOVE pulled pork. My slow cooker generally gathers dust but I'm thinking about breaking it out now. Great recipe. OMG. My husband would KILL for some of these. Definitely showing him this recipe. What a fabulous recipe for the pulled pork. I must bookmark it to copy and print your recipe, along with the yummy jicama slaw that I never really made! 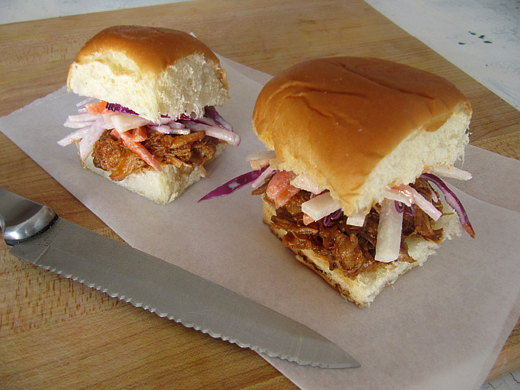 I love pulled pork on King's Hawaiian Rolls - it's like the perfect little bite of sweetness to balance the spiciness of a good barbecue sauce or dry rub. I totally agree with you. They don't photograph as nicely as special slider buns, but they completely make up for it in flavor. It's 11:00pm and I'm reading this post and absolutely drooling. These sound so good I wish I could have one right now. Plus to serve them on Hawaiian Rolls have to be the best. I love those and the bread. Thanks for sharing. I might try making these this weekend. I try to think about whatever I can that is not OW OW OW OW OW while I'm at the dentist....and most often that's food! Jicama is such a funny veggie but its so tasty and has really grown on me! Using it in slaw is a great idea! Pulled pork sandwiches are my fave meal . This looks delish and I will be trying this version soon! Love slow cooked food. Love pulled pork. Love the acid in the slaw. Wow I'd like to thank your dentist for this delicious meal. Lol. This looks really good. I'd eat ten or twenty. I love sliders and this one looks fantastic. You have me craving one now! I have to go to the dentist too! I have a toothbothering me and I keep postponing it for obvious reasons! The pulled pork sandwiches are mouthwatering, perfect for a remedy after the dentist! Looks tasty! I love the crunch of jicama. It doesn't have a ton of flavor (to me at least) which makes it the perfect vehicle in dishes where you want the crunch. I usually like to snack on it straight with a bit of chipotle chile powder and salt. Never though to use it in a slaw though - fantastic idea! Making this over the summer - can't wait!